I have several stacks of quilting and craft patterns that I've started going through to list in my shop. 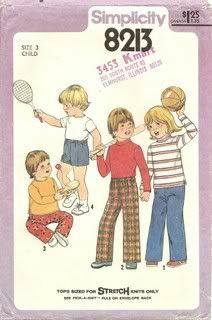 It seems some of these would be a great place to start sewing and have set aside several for consideration. 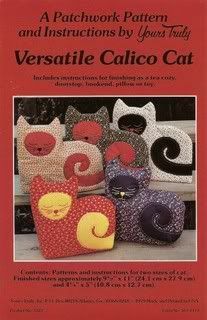 Then, I picked up this one - Versatile Calico Cats by Yours Truly. This one seemed simple enough. It's one of those multi-purpose patterns that can be used to create anything cat related from an adorable wall hanging to a doorstop. At first I was thinking about trying a simple pillow. BUT, I don't really need a pillow. 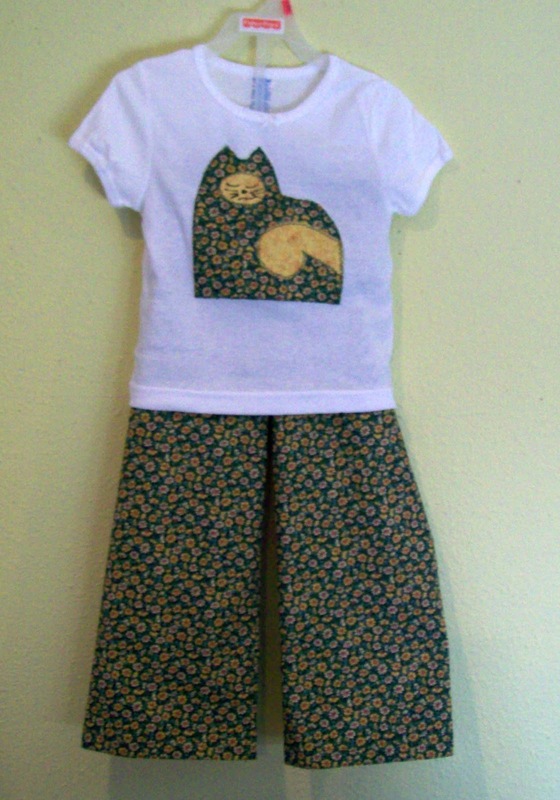 Then the thought started, I'll start real simple and make an applique T-shirt for Lilly (for her Valentine box). I don't quite feel up to sewing a t-shirt (don't I need a serger for that? ), so I made a quick trip to K-Mart and picked up a couple packages of Toddler Undershirts. Back home, I selected some green Calico Fabric, of which there is about 3 yards. This excess fabric led me to decide on a pair of bottoms to go with the top. Having a couple thousand patterns in the house makes this type of decision quite easy. I decided on Simplicity 8213, primarily because it had the elastic waist (easy), it was the right size and it is already cut. Then, here and there over the next four hours, I did it ! 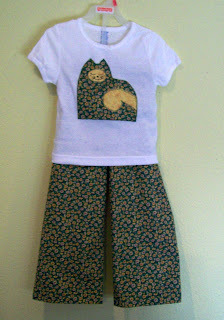 I sewed a little pair of pants with a t-shirt that has a matching applique. The pants seem huge. I hemmed them up further than the pattern called (look Ma, I'm already doing alterations! ), but I'm afraid they will be huge on her. But, I'm pleased that I conquered both these simple projects with no major issues.